Lyceum of the Philippines University – Laguna is considered one of the best schools in the Philippines, a community of learners, achievers and movers of society. To adapt to Department of Education’s (DepEd) implementation of the K-12 curriculum, Lyceum of the Philippines University – Laguna (LPU-L) now extends its program offerings to high school students, Grades Seven and Eight. 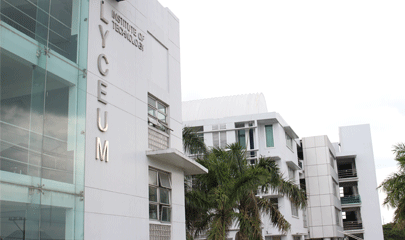 The Lyceum of the Philippines University – Laguna International High School has its mission to prepare all types of learners of various nationalities and cultures for global competitiveness. Our students are our greatest asset, and take centre place in our community. LPU Laguna’s students are eager learners and curious about the world around them. We aim to prepare well-rounded global citizens who strive for excellence and understand the importance of respect and tolerance for others. “It is a status claim to be able to have such accreditation!” Dean Lilian R. Silang exclaimed, upon hearing the news that the College of International Tourism and Hospitality Management (CITHM), together with other LPU Schools, has been accredited by the International Centre of Excellence in Tourism & Hospitality Education (THE ICE), making LPU the first and only educational institution in Southeast Asia that has this five-year membership from THE ICE. THE ICE is an independent international accreditation body with headquarters in Sydney, Australia that specializes in tourism, hospitality, culinary arts and events education. Its main activities are confidential benchmarking and raising awareness of the quality of accredited members to future students. Australian School of Management, Blue Mountains International Hotel Management School, Emirates Academy of Hospitality Management and Griffith University are just some of the other schools with the same grants. The recent Employment Report from the Palaestra Consortio Office of Lyceum of the Philippines Laguna (LPU-L) reveals that 63% of LPU-L’s graduates find employment within six months. The report, which covers graduates from School year 2013-2014 (Graduated in May 2014), showed that more than half of LPU-l graduates found work within three months. Among the five colleges of the College of Business and Accountancy (CBA) leads the way with 83% of its graduates employed after six months. This is followed by The College of Engineering (COE) with 77%. The College of Arts and Sciences (CAS) rounds out the top three with an employment rate of 71%. The report also showed that 62% of those who responded to the survey were employed in industry, the highest employment destination for LPU-L. This is followed by the IT Business Process Outsourcing field (BPO) with 12%,, while the academe tallied 8%. To read more about the High Employment Rate, click here. Palaestra Consortio is Latin for ‘training partner.” This is the arm of the school that deals with placement and internship. It also houses LPU-L Alumni Society. LPU-Laguna continues to raise the bar and re-affirm its commitment to excellence when it was granted a site visit by the Philippine Quality Award (PQA) assessment team on September 25-26,2014. Over a two day period, members of the assessment team from QS Philippines went through several areas: Leadership, Strategic Planning, Customer Focus, Measurement, Analysis, and Knowledge Management, Workforce focus, Operations Focus, and Results. All facets of the organization were scrutinized an reviewed. Members of senior management, and all of LPU-Laguna’s department heads, along with the President Dr. Peter P. Laurel, were present throughout the two day assessment. The Philippine Quality Award (PQA) is the Philippine equivalent of the Malcom-Baldridge frame work of excellence. It is the highest award a company or institution can receive, and i bestowed by no less than the President of the Republic of the Philippines.